KENNEDY – Mark and Tonia Wilson created Wilson Endurance Sports to organize triathlon events in the area, but they believe their work can have an even greater impact after learning the county ranks last in health and length of life statewide. Mark Wilson has been an independent triathlon and endurance coach for 20 years. The Wilson’s are both originally from Mayville. The two reunited almost 30 years later after first knowing each other during school. “All the love was still there,” Mark Wilson said of rekindling his relationship with Tonia Wilson. And when the couple married in 2016, they decided to go into business together as well. Combining Tonia Wilson’s administrative and front office experience with Mark Wilson’s triathlon experience, Wilson Endurance Sports was born. “It started off from my coaching,” he said. The company features the coaching aspect with 47 clients and then the triathlon event management. Wilson Endurance Sports will host 27 events in New York and one in Connecticut in 2019. While their busy season hasn’t necessarily begun, their first winter event was held in February at the Chautauqua Harbor Hotel in Celoron where 250 participants attended. The race production aspect of the company has taken the couple all throughout the state. Fifteen of the 27 events take place in Chautauqua and Cattaraugus counties.Wilson Endurance Sports will also be managing the Gran Fondo summer bicycle event in Mayville. Wilson Endurance Sports will see an estimated 3,500 athletes from race production alone. 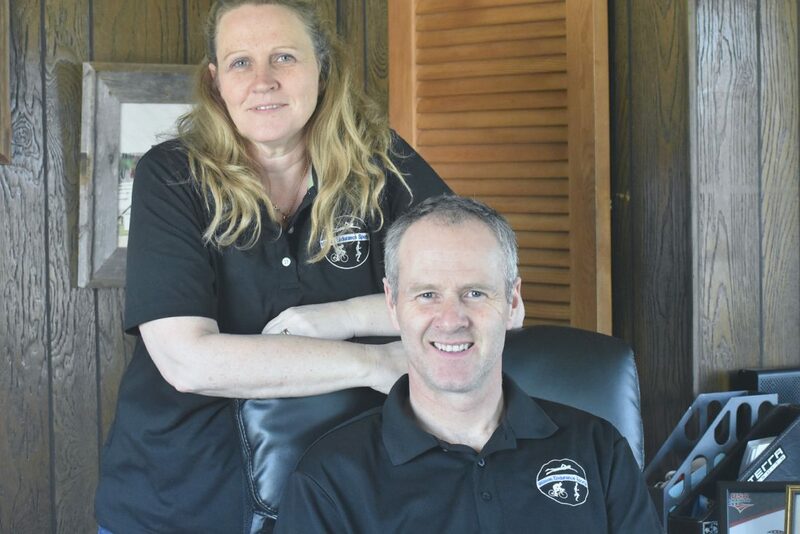 The idea to bring triathlon, duathlon and other cardio-related events to the region was sparked when the couple got a look at Cassadaga Lake for the first time since returning to the area. “Here we are beginning year three and it’s just been great,” he said. The company, since its creation, has only grown. In 2017, they organized nine events and 22 in 2018. For 30 years, Mark Wilson coached in the Hudson Valley area for the Hudson Valley Triathlon Club. Before returning to Chautauqua County, there was no triathlon club in the area. But now, the Wilsons created the Southern Tier Triathlon Club. “When we saw Cassadaga Lake, that’s what spurred it,” he said. The company also gives free lessons to people including running and swimming clinics. On top of that, Mark Wilson also will provide a 30-minute consultation over the phone to instruct individuals on healthy habits. “I’ll work with anyone,” he said. For the couple it’s not about how much money Wilson Endurance Sports, but how many people’s lives they can change. Thus far, the event company has impacted an estimated 3,500 people. Tonia Wilson admitted her husband can get “passionate” about exercise, and running specifically. Mark Wilson’s general advice to everyone is to simply be active and move. He compared deer, who are always eating yet remain thin, to humans. He believes because of advancements in technology and the evolution of the workplace, humans continued eating, but stopped moving, generally speaking. According to a recent report by the University of Wisconsin Population Health Institute and the Robert Wood Johnson Foundation, Chautauqua County ranks 59 out of 62 counties in the state in the category of health outcomes. This is a worse ranking than last year when the state ranked 58th. “When you ask me why I’m here, this is why I’m here,” Mark Wilson said. Wilson Endurance Sports hosted it’s official opening event on April 13 in Hudson Valley. The next event will be held in Randolph April 20. The company is based out of their home and they can be reached at 914-466-9214. Upcoming events can be found at coachmarkwilson.com. “My goal in life is to see people enjoy movement for all of their life not just parts of it,” he said.